All donors will receive a pin to express our gratitude and to help us spread awareness. If you would like to donate, please include your pin request as well as your address along with your PayPal donation, or email blackribbonproject@gmail.com with the same information. Pins will be mailed as soon as possible after receiving your donation and pin request. Bulk orders: If you would like to obtain a larger number of pins for bulk distribution, email blackribbonproject@gmail.com. Arrangements will be made individually. For information on bumper stickers, see here. For information on sticky notes, see here. I appreciate the work you are doing! Sounds good………but the cadeusus is the symbol of war and piece….not medicine! It is the Aesclaepius with its similar appearance that symbolizes medicine. You need to redesign the pin. You mean War and “Peace”? Dear Dr. Starkman, I any many others now feel we are are War, for the President and the Scotus has declared just that on us. My purpose is to promote health care freedom–not try and correct the mistaken medical symbolism. Thanks for the comment—and if you know of a place to get Aesclaepius pins, I’d love to learn of it. Dr. Starkman: Are you trying to impress everyone with your brilliance? As long as you have chosen to go back to the ancient Greeks, I would like to inform you that the original healers were women (Olde English-crones) who practiced Black Magic (Wicca) and purported to employ the use of snakes for some of their potions, therefore when the medical profession became more reputable, the snake was used for the cadeuces. It is a fitting symbol. you are making the wrong assumption that early healers all practiced “Black Magic” or wiccan forms of healing. While some healers may have entered into the world of “black arts”, the traditional use of herbs, animal parts, potions (including cob webs to help wounds to clot), music, energy healing or prayers does not automatically equate to “black magic” or Wicca. Kudos to the Black Ribbon Project! Thank you for your dedication and determination to overturn ‘obamacare’. You have an impressive site here! Those comments above are the Smarts comments. To miss the main point they will see any little imperfection. Thank you Terry. Spread the word! OMG please dont tie this great and meaning project in with chiros, they cause more harm by increasing health care spending with unproven treatments and shady billings of state/federal programs. Healthcare freedom means freedom of choice. With freedom of choice comes disagreement with other people’s choices. Individuals spending their own money is not the cause of run-away healthcare spending. It is the fact that so many of the dollars spent are “other people’s money” and the cost-inflating mandates via laws and regulations. If we can get back to the place where people are only spending their own money, or money donated to them voluntarily, then it will be no one else’s business how that money is spent. 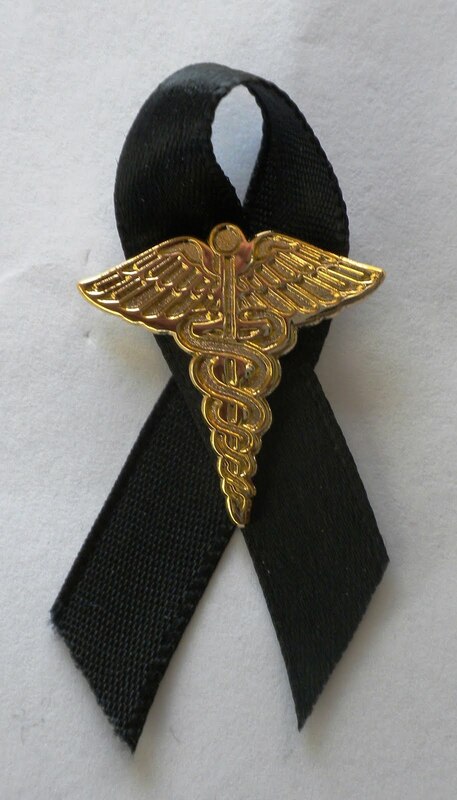 The symbol chosen here is the most popular in the USA today, it is the Caduceus representing Air Force medicine. The original was one snake climbing a single wooden shaft. You’ll find it in books, but rarely in stores. So more power to you for the project. I’ve not yet decided how many I’ll order.